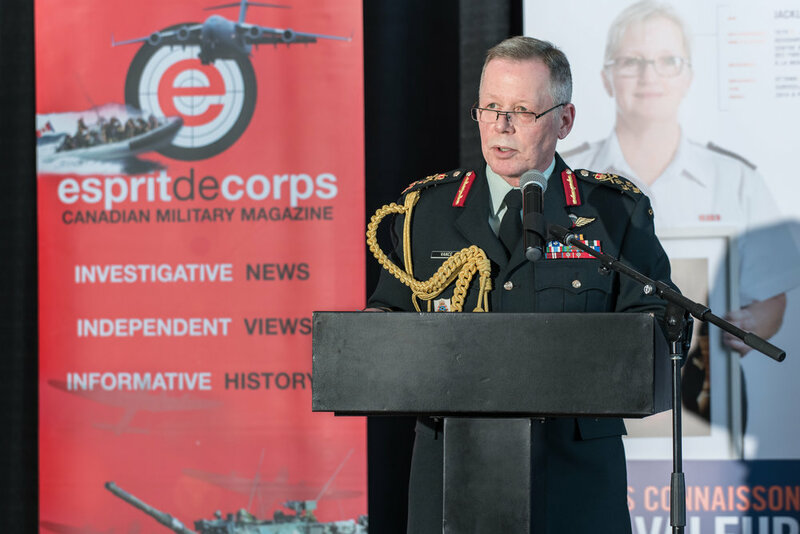 Esprit de Corps’ 2019 Breaking Down the Barricades: Women in Defence World awards ceremony saw a diversity of dignitaries and military professionals come together to recognize and celebrate the achievements of this year’s 21 award recipients. A warm spring breeze welcomed the winners and contributed to the swelling sense of pride that was evident in the Sacred Space room at Beechwood National Memorial Centre. 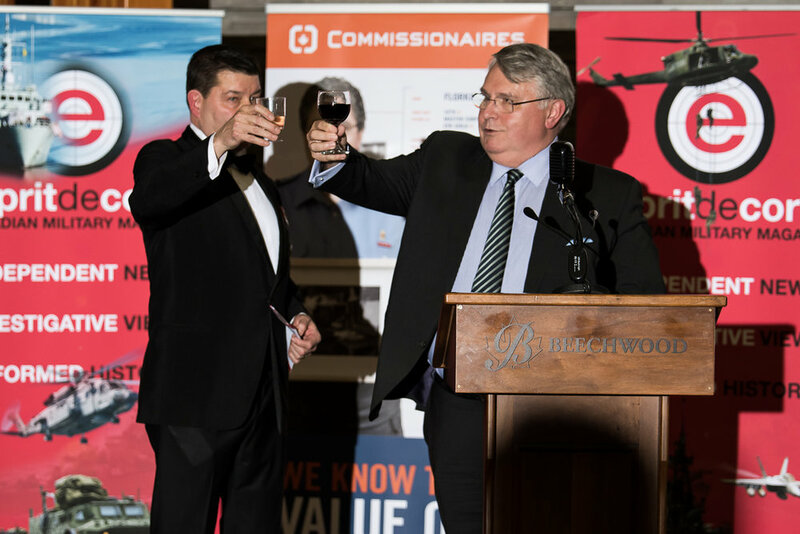 Beechwood representative Nicolas McCarthy and magazine publisher Scott Taylor kicked the night off and were followed by a video presentation of the history of women in the Canadian Armed Forces. The awards from Esprit de Corps, based on nomination submissions and peer review, are now in their fifth year running and Taylor commented on this milestone in his opening remarks. “As soon as we did it, word came back and said we can’t not do it again because I know somebody who’s my colleague, I know somebody who’s my mentor who had to be nominated.” The awards and their importance only grew from that point, with the numerous women nominated receiving their own recognition and certificates as of last year. One by one, the women took to the stage to receive their 2019 Women in Defence plaques, while representing nearly all of the nation’s provinces in the process. From advocating for veterans, to innovating defence-related technology in the business world, and standings on guard for their country and serving in all three service branches the women featured at the event came from a diversity of backgrounds. In a first for Esprit de Corps and the women in defence awards, Maj Ann Lockhart and MWO Margaret Stawarz were nominated and awarded as a duo of women that have broken down barriers in the defence world. While receiving their awards, the two women along with the crowd laughed as they shuffled about and accommodated one another on the stage for a photo. 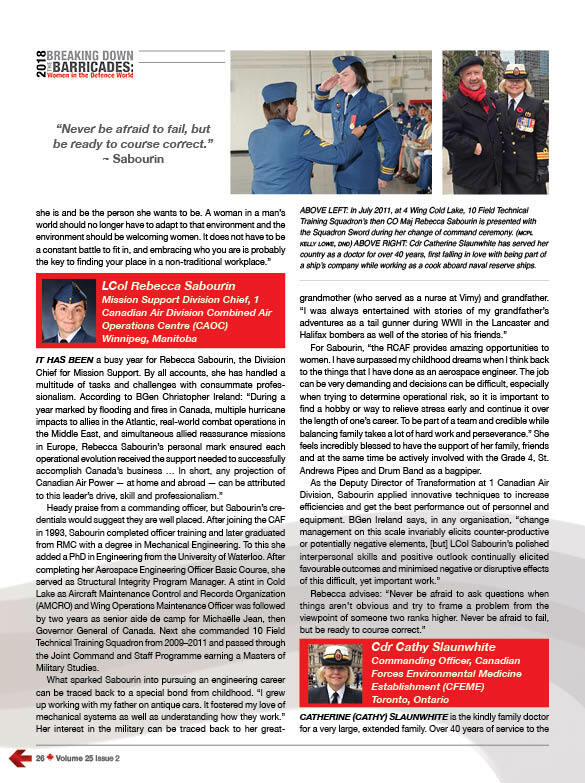 MGen (Ret’d) Lewis MacKenzie and LGen Charles Lamarre addressed and thanked the award recipients for their dedication to Canada both inside and out of their professional lives. 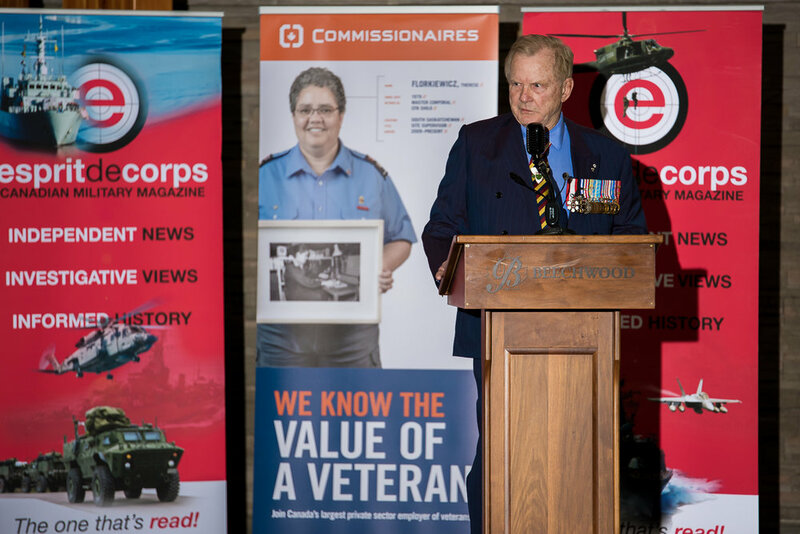 Following the lively performance of an original song titled “Honour and Pride” by Jean Miso, an award-recipient herself, event sponsor Commissionaires closed the awards ceremony. The night was only just beginning as guests enjoyed a diversity of food and drink, generously donated by various high commissions and embassies. The reception dinner featured Serbian cevaps, German pretzels, South Korean bolgogi, Polish kielbasa, Turkish baklava, and fine Chinese whiskey. The event saw individuals from incredibly different backgrounds enjoying traditional foods from all over the world. The one thing that everyone attending had in common, however, was a shared pride in the women who had worked so hard and in their own unique ways, broken down barriers in the defence world. By James G Scott, Mateo Peralta & Adam Peace. 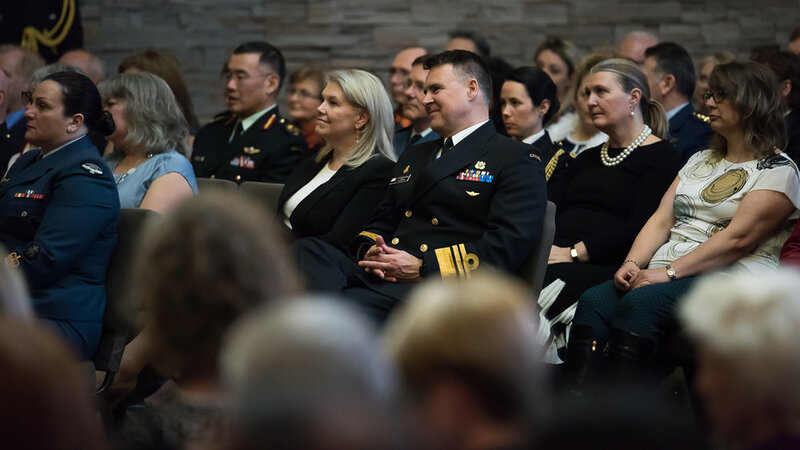 This year's Women in Defence awards initiative by Esprit de Corps was the biggest yet, culminating in an award ceremony and cocktail reception attended by dignitaries and family members alike. The evening event included speeches from Governor General Julie Payette and Chief of Defence Staff General Jonathan Vance. A highlight of the night was a heartfelt toast to the winners, given by Maj (Ret'd) Sandra Perron, the first female infantry officer in the Canadian Military. We are proud to present video footage of both speeches, as well as a video tribute to all the award recipients. 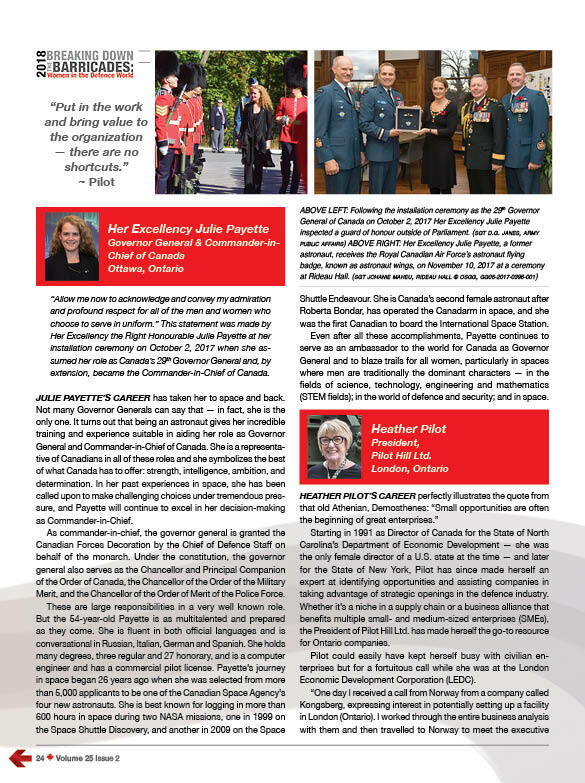 Governor Gen. Julie Payette delivers a speech to the 2018 winners of Esprit de Corps Women In Defence awards. 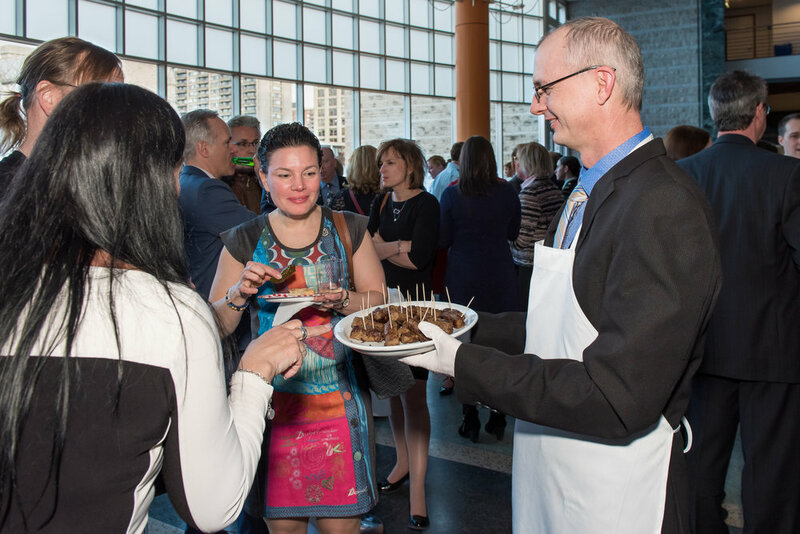 The annual award ceremony and celebrating cocktail reception were held in Ottawa's city hall on April 9, 2018. Chief of Defence Staff Gen. Jonathan Vance delivers a speech. Regrettably, the French portion of the CDS speech is unavailable due to a technical issue. We apologize for any inconvenience this may cause. 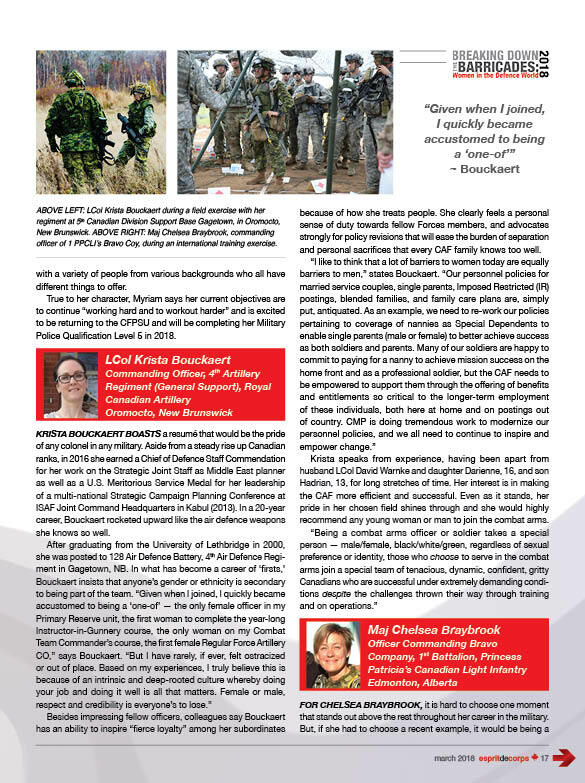 On Monday, April 10, Esprit de Corps Magazine hosted a cocktail reception in honour of those women we have profiled for their tremendous contribution to the Canadian defence sector. 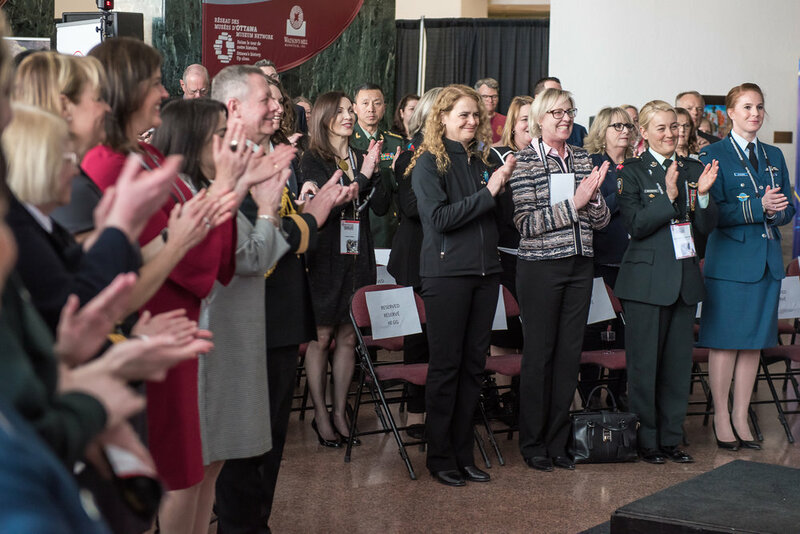 On hand was a near-capacity crowd of 500 at Ottawa City Hall, including a total of 43 recipients selected in the last three years of our annual Top Women in Defence Award. The initiative began in 2015 as a way of recognizing the positive impact so many women have had in what is largely considered to be a male-dominated field. 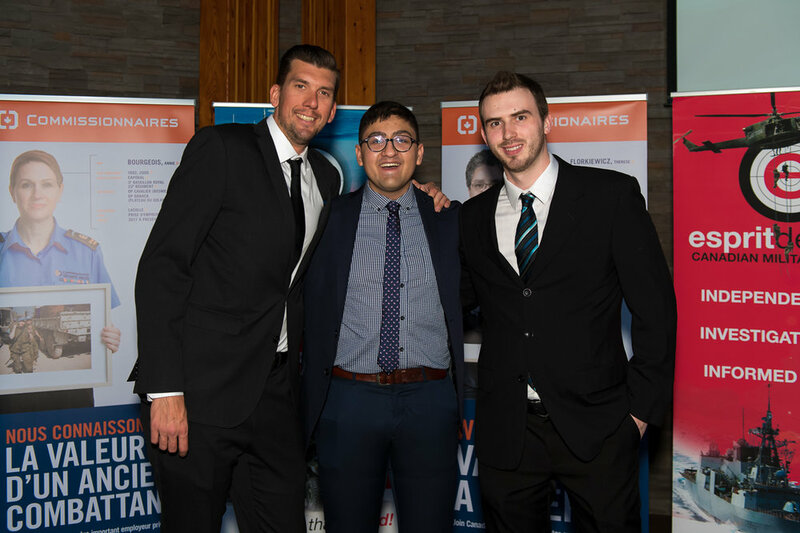 This year was the first time the magazine held a formal event to celebrate the recipients. Although unable to attend in person as they were overseas at the Vimy ceremony in France, both Minister of Defence Harjit Sajjan and Chief of Defence Staff General Jonathan Vance sent personal congratulatory messages. Vice-Admiral Ron Lloyd was on hand to deliver a salute to these remarkable women. We would like to thank the 14 embassies (Germany, China, Venezuela, Turkey, Serbia, France, Australia, USA, South Korea, Poland, Russia, Chile, Netherlands and Azerbaijan) that contributed an exotic assortment of food, booze and beverages to the reception. Local Celtic band Jiggs Boson created a festive atmosphere throughout the entire three-hour event. One highlight of the evening was when former Ottawa news anchor and Second World War veteran Bill Luxton serenaded the two Women’s Royal Canadian Naval Service (WRCNS or WRENs) veterans who were present, Mary Owen and Elsa Lessard, with the WWII wartime hits We’ll Meet Again and (There’ll Be Bluebirds Over) The White Cliffs of Dover. The WRENs gustily sang along and danced while some in the crowd were moved to tears. Recipients are peer nominated for their positive influence within the defence field. This of course includes regular and reserve personnel, veterans, cadets, defence industry, science, politics and media. If you would like to nominate an individual for consideration next year, the nomination deadline is January 12, 2018. Please include the candidate’s name, contact information as well as a brief outline describing their achievements in their field and any other pertinent information including, but not limited to, commitment to duty, role as a mentor or leader, community involvement, etc. to nominations@espritdecorps.ca.